Gold green, salty and crunchy. Our Sea Nuggets are deep-fried, crispy bites with the briny flavours of the sea; somewhat resembling Dutch ‘kibbeling’ or fried fish. Formally known als Dutch Weed Bites, Sea Nuggets are the new snack on the block! 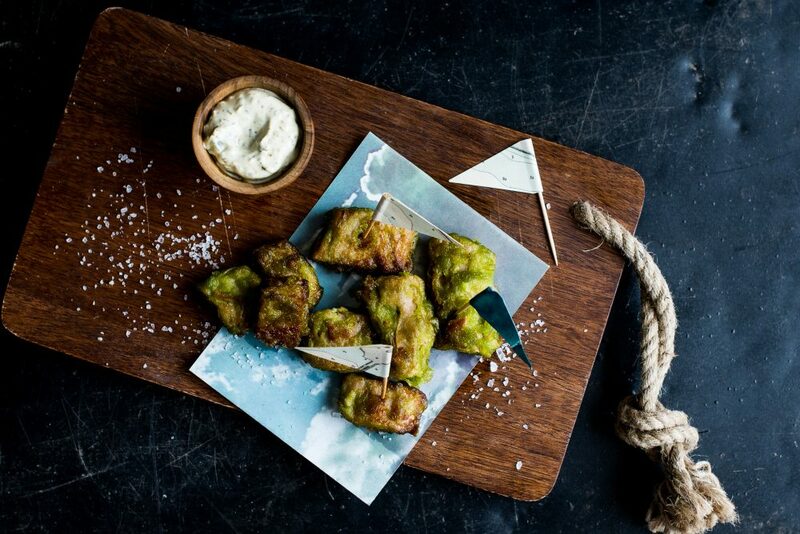 These nuggets are deep-fried, crunchy golden green bites with a salty sea flavor. They’re made of protein rich beans and micro-algae: that’s pure green protein power! What the Sea Nuggets taste like? People say the structure and bite reminds them of ‘kibbeling’ or clams. We simply say vegan seafood. At The Dutch Weed Burger Joint and at festivals we serve them as the plant-based version of the classic Fish ‘n Chips, but we call it “Wish ‘n Chips”: Sea Nuggets with our Weed Sauce and homemade potato chips. Or have them by themselves as a pre-dinner snack while having drinks. They go very well with a nice cold beer! The Sea Nuggets are entirely palm oil free, vegetarian, vegan, gluten free, kosher and halal. Literally everyone can enjoy them! We use soy beans from controlled cultivation in mostly Europe (75%) and North America, obviously NON-GMO. Right now we’re even testing soy from Dutch soil! Our Weed Sauce is made from organic ingredients and enriched with Sea Lettuce. We’re continuously working on optimizing our entire production cycle to make our products as sustainable as possible. EAT WEED LIVE LONG!